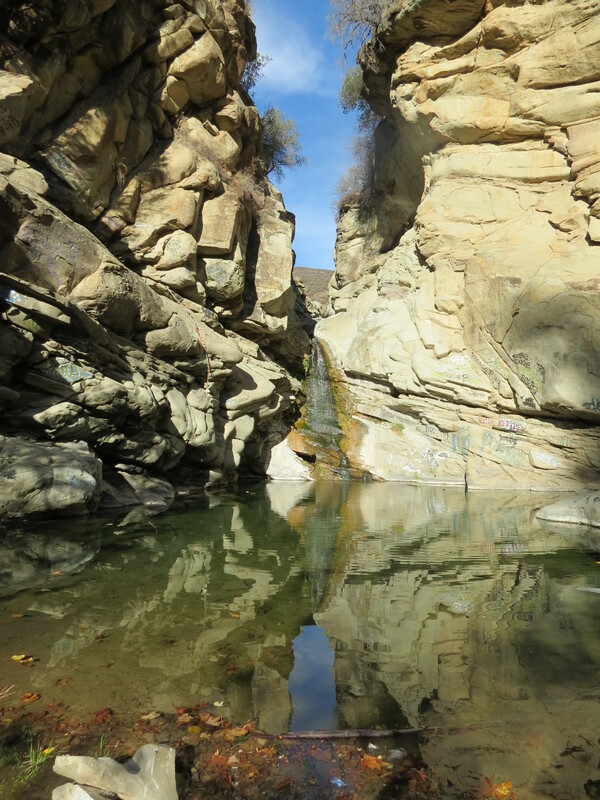 Santa Paula Canyon - Ojai - Beyond Limits on Foot! To get to the trailhead: From the 5 North, take the 126 east for about 22 miles. Take 150 North (right) for about 5.8 miles and you will hit St. Thomas Aquinas College. Park outside of the school as it is illegal to park inside. You will have to walk on a paved road and follow the signs to the actual trail, but it’s well worth it. First mile or so, yes we spent it on a boring old paved road. But, the view of the school was quite nice and walking by a cute little pond with ducks swimming in it (oh wait, until we saw the sign that said “Treated sewage water, please do not drink”). And of course the avocado trees that surrounded us were guarded by two dogs that barked for no more than a second as we hit a couple oil pumps. The trail goes to the left on the edge of the fence and continues on to Santa Paula Creek. Once we hit the creek and Santa Paula creek, there must have dropped about a 20 degree drop, but of course this one time I didn’t bring a jacket (recommended to especially during the “winter” months). Though after some more trekking we didn’t really need the jacket as the canyon couldn’t make a choice of cold or hot. Quite interesting as soon as we hit a shaded creeky area the drop was immense, but as soon as we stepped a little away from the creek it was the normal 70 degrees that day. We hit so many swimming holes and the color of the trees were a normal fall color that you don’t often see in the city. After losing the trail many times, we decided that no matter what stay by the creek and well every single time we ended up on “the trail” even though there are many little random trails that all go to the same place. I still recommend a map, gps (if you have one), compass anything that will keep you on the right track. We ended up going up to Big Cone Camp and on way down kept going instead of down to the falls. At Big Cone Camp, you can overnight it, but need to get a fire permit at Ojai Ranger Station down the hill. The trail gets even worse as you head up and after a couple miles in we decided to finally turn around. We had to jump over the river a lot, many scratches were acquired and we passed a couple small little campfire pits/campsites. After heading back down we saw the sign for the falls and headed down only to find a couple teenagers just hanging out. We made ourselves comfortable and they proceeded to leave. At this point I could only hear our voices echoing. This definitely gave me my hiking fix as I heard that this place normally was completely full of people. I recommend anyone who doesn’t want a crowd to come during “winter” as this worked for us. BUT, there was soooooo much griffiti & trash around. This was the first hike where I decided from now on I will be bringing a trash bag in to carry out trash that was left by those people that don’t appreciate what’s out there for us! Apparently the forest service also cleans off the graffiti, but somehow it always returns. After eating lunch we decided to head down and get back to the cars; mostly because the sun was slowly going down behind the canyon and it was getting colder. Took us less than 1.5 hours to get down and this was the second sign of human life as we could hear some kids having fun by the creek where there were a couple swimming holes. Note to self: Bring a suit as you could swim in the water; it was definitely clean enough as it is running water.